The wood beams outside of the front entrance have been peeling paint for years. I guess I was hoping that mother nature would complete the paint stripping job for me. However, I do want to try and save the wood before it is too far gone. As far as we could tell, the painting that was done, was NOT done properly. We believe that in an attempt to sell the home quickly, paint was slapped on without proper preparation. This paint started peeling about a year after we moved in. This was confirmed when a neighbor told me that they remembered seeing the son-in-law of the previous owner painting the house before they put it on the market. 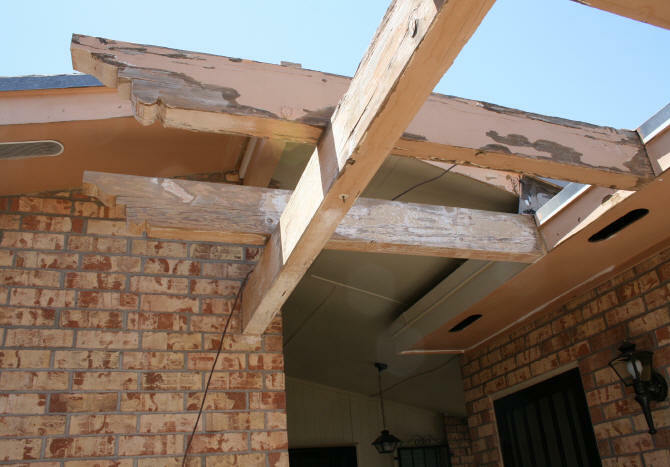 The beams are decorative and do not support the house. 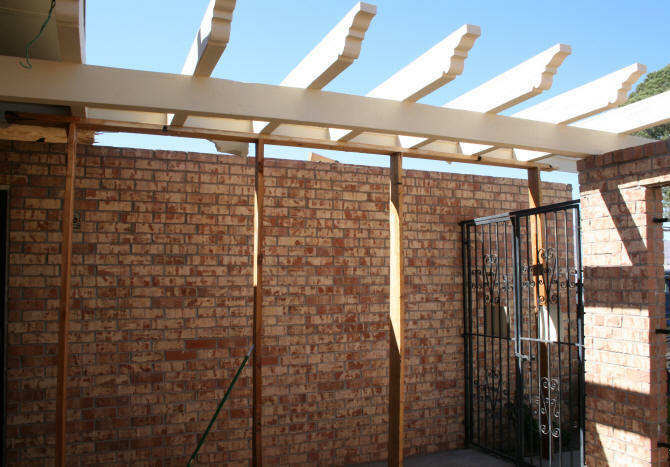 I like them because they provide shade to the front patio. 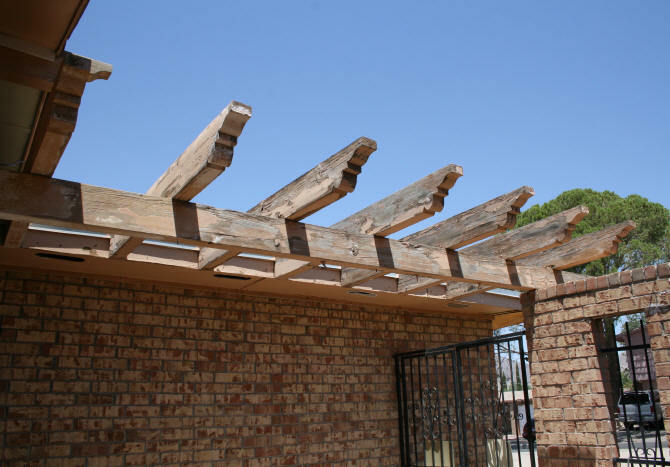 There are a total of seven 6-foot long beams and the 16-foot long beam that holds them up. On October 24, 2013, I started scrapping off the paint that was loose. 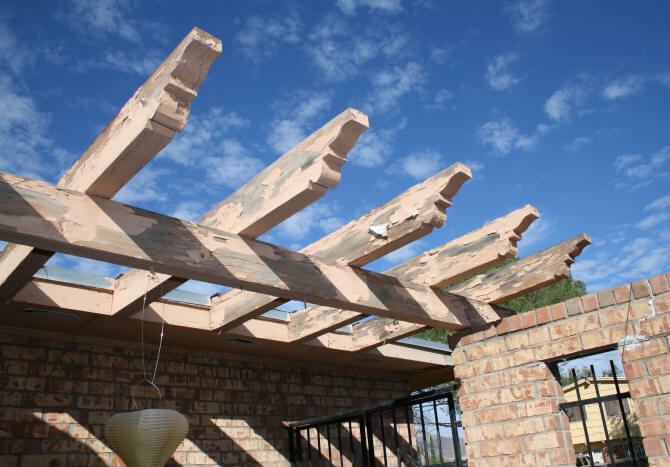 What I discovered was, that these beams are really in bad shape. Really in bad shape. 3) Remove the paint and leave them bare for a "rustic" look. June 2014 - I have resumed this project as part of my overall task of repairing and painting the entire outside of the house. Part of the backyard areas of the house have been painted the new beige/green color as part of my storage shed, column wraps, and backyard wrought iron door projects. The front entrance area has also been painted the new color. I am continuing the front area of the house that includes the terrible beams. As of June 21, 2014, I am trying to get all of the paint off the beams. I figure this will take a few months, working a few hours a day, in temperatures of 90-105 degrees perched on a ladder.. I have peeled off most of the paint that came off easily with a scraper. I am now using a striper to get the rest of the layers of paint off. Photographs of the beams on June 21, 2014 are below. If you think they look almost the same as the photographs taken above 8 months ago, yea they do, just less paint.....sigh.....many hours were spent just getting to this point. July 4, 2014 - It finally looks like I am getting somewhere with this project. In addition to the beams, I am also working on the roof soffits and fascia boards which need the old caulk and cracked paint removed before re-caulking and painting. 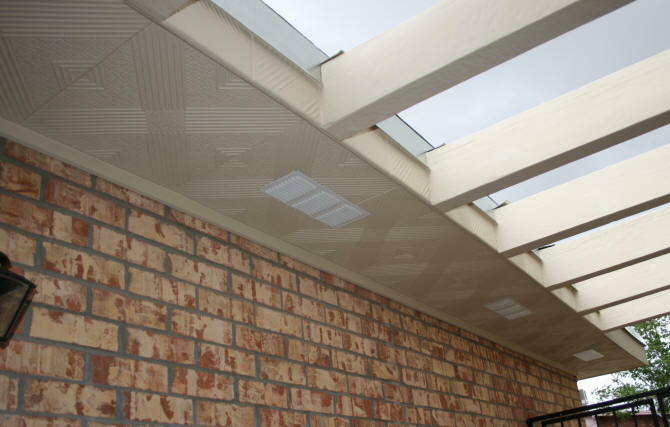 I am also replacing the soffit vent (undereave vent) covers. The old vent covers have disintegrated. 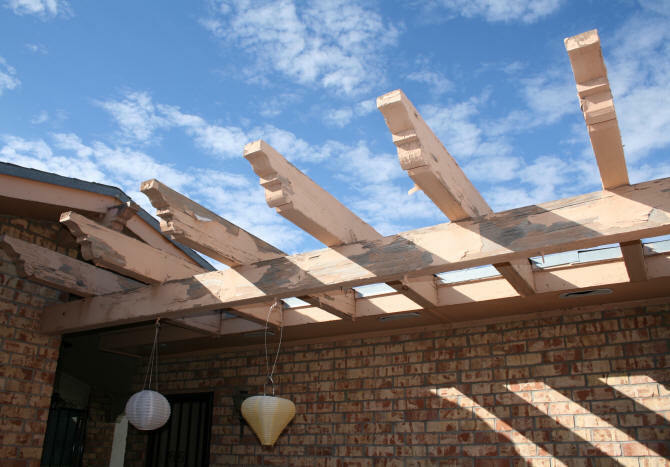 The beams are being stripped to bare wood. Then sanded until there is fresh wood and I can smell the pine. The knots in the wood that have popped out or actually... not have shrunk as much as the surrounding wood, are being leveled out. Two coats of oil based primer were used before I placed one coat of latex paint on. I will paint a second coat of latex paint after all the beams are done. Why don't I just finish stripping, sanding, and prepping before painting? Simple, I get bored doing just one tedious task over a long period of time. My muscles get fatigued too quickly. By varying the tasks, I am using different muscles over shorter periods. July 5 - 17, 2014 - I finally finished removing the paint and sanding down beams 2 - 4. On these beams, there were some chunks of wood missing from the beams or holes where there was a knot in the wood. I filled these with Bondo, which I had on hand. I then sanded the Bondo down. These are the gray areas on the wood in the photo below. Beams 2-4 sanded and ready for priming. Gray spots are Bondo to repair damaged wood. Beams 2-4 with first coat of primer. At this point, I am officially half way done with this project. July 18 - 26, 2014 - I finally removed all of the old paint from the last three beams. They were sanded with a few holes repaired with Bondo. The beams were then primed. 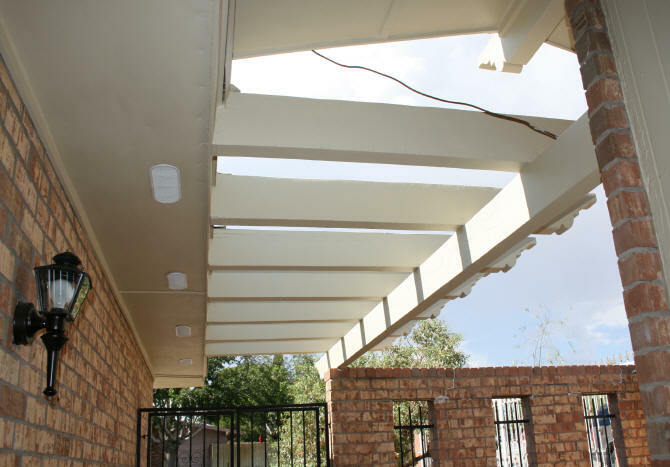 July 27 - 30, 2014 - I have finally finished painting the beams with my latex paint and the surrounding roof area. Below are the photographs of the finished paint job. I hurried to get this finished because rain is being predicted the next couple of days. In fact, when I took these photos, there were a few thunder clouds forming. Fortunately this paint dries fast. View of the beams from the street side looking in While the paint job is now finished, I want to do one more thing to protect my two months of hard work. I will be placing a shade cloth over the top of the beams. The reason for this is twofold. First, working on this for two months in heat ranging between 90 - 105 degrees, with very few cloudy days, you discover how brutal the heat and sun are. 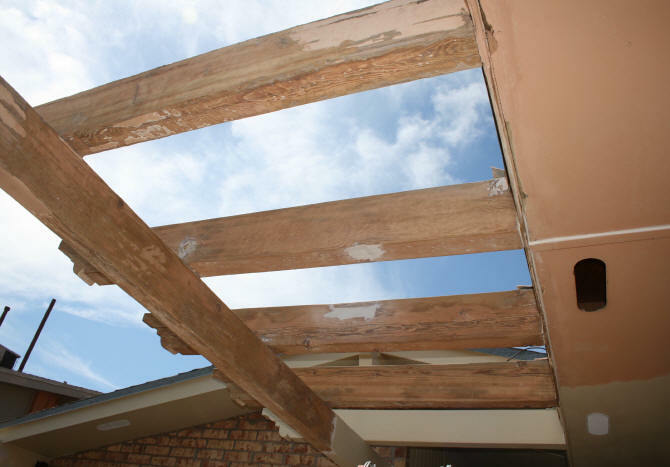 Second, on top of the beams there is the most damage to the wood. 5 of the 7 beams have deep cracks running along the length of the beams. To have sanded this all the way down, I would have lost 1/4" - 3/8" of wood. Great attention was made to the top of the beams to make sure the paint was oozed into each crack. However, because of the sun, this is where I fear the paint will eventually fail first. 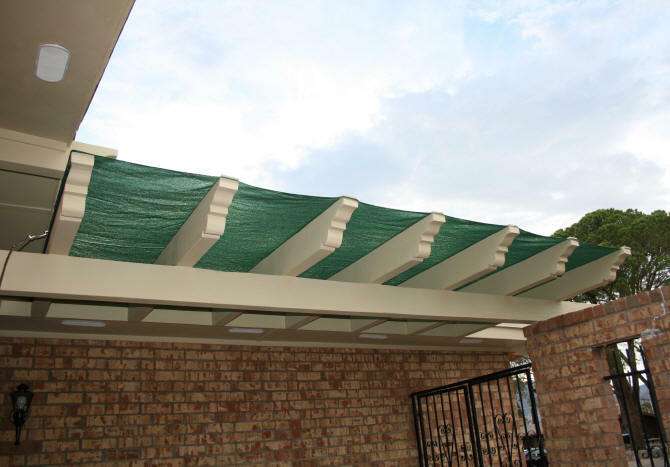 To prolong this paint failure from happening any time soon, the shade cloth will be attached to the beams with a piece of moulding that completely covers the top of each beam. The moulding will be screwed on with 1 5/8" cement board screws (rust proof) on the top. 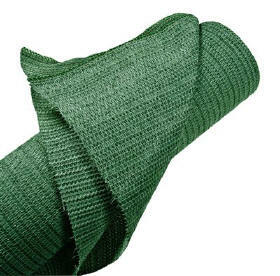 Coolaroo shade cloth The shade cloth that I used was the Coolaroo Shade Cloth in heritage green that I bought at the Home Depot online. I bought the 6' x 15' roll for $37. I had wanted a tan color but this particular color appears to have the most UV protection of 90%. It comes with a 10 year UV warrantee. If I get at least 5 years of use from it, I will be pleased. The fabric is finished along the long edge but is not finished along the 6 foot edge. For my purposes I needed to sew a hem along one edge to accommodate a 1" x 6' long steel bar to weigh down the cloth over the first beam closest to the house. I sewed this hem on a sewing machine. Since we have wind storms in El Paso, I needed to secure the shade cloth firmly to keep it from flopping around and tearing. I purchase six pieces of 3 1/4" primed base moulding which just about covers the top of the beams. After cutting the moulding to fit each beam, I painted them with two coats of the same latex paint I used on the beams. 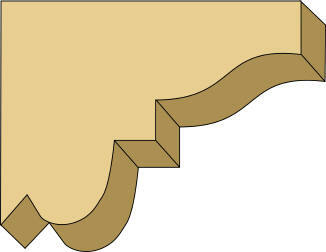 As mentioned above, the moulding on top will also protect the top part of the beams from more sun damage. I started installation on the beam closest to the house. The edge with the sewn hem was placed here and the spay painted steel bar was inserted to weigh down the end. I let it overlap the beam about 3". 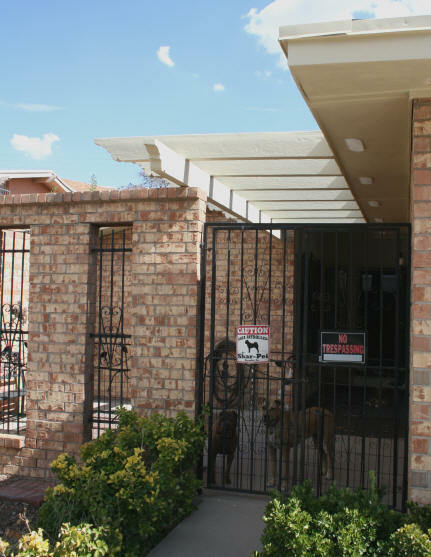 The reason why I did not permanently fasten the shade cloth to the first beam is because of roof access. 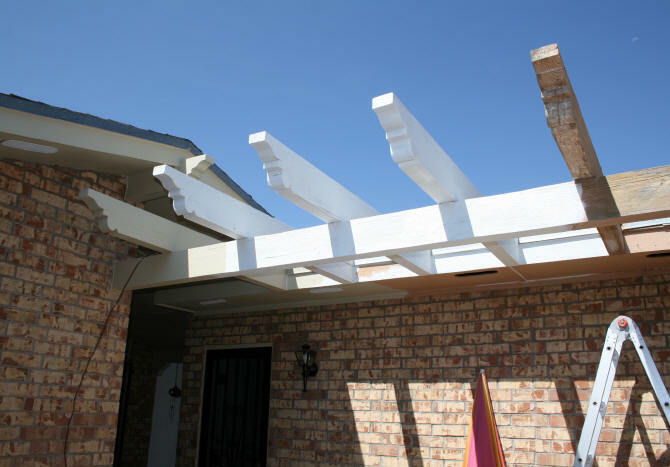 The safest access to the roof is between the first and second beam. 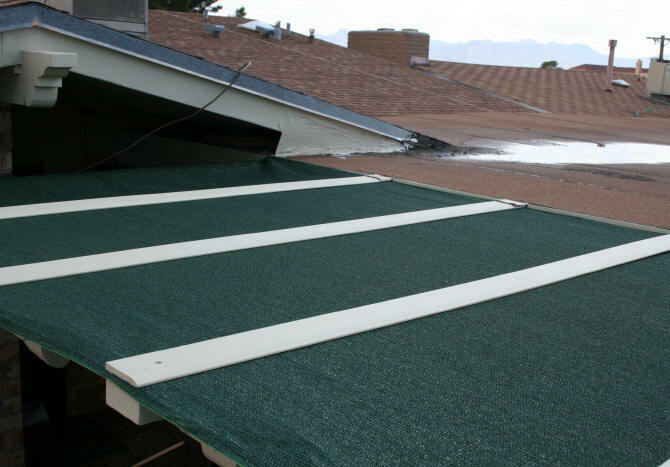 We need to be able to access the roof several times a year to maintain the swamp (evaporative) cooler. (See ladder in place here...) When I need to get on the roof, the shade cloth will be moved out of the way to make room for the ladder then placed back over the first beam when done. I then draped the shade cloth over the second beam, flattened it out and stapled it in place on top of the second wood beam. I then placed the moulding on top of the cloth. Sliding the end nearest the roof under the roof flashing. I then secured the flashing to the beam, moulding, and shade cloth with a screw. The moulding was then secured with one screw in the middle and then another 2" from the end of the beam. For the remaining beams, the shade cloth was stretched firmly and then stapled. Moulding slipped underneath roof flashing. Flashing then hammered down and secured with screw. As I installed each piece of moulding on top of the beam, I placed some caulk on top of the center and flashing area screws and dabbed a little paint on. I want to prevent any water from seeping in around the screw holes. 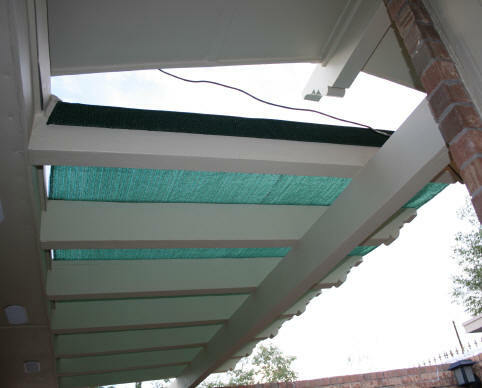 I needed to do this as I went along because I would not be able to easily reach this part of the beams after the shade cloth was installed. For the last beam, I stretched the cloth, stapled it in place, and then cut off the excess cloth about an inch past the beam. I then folded up the 1" excess onto the top of the beam and stapled it in place. The moulding was then placed on top and screwed into place. To change the cloth in the future, it is just a matter of scrapping off the dab of caulk and unscrewing the moulding. The staples would then need to be removed before remove the cloth. down with a metal bar inserted in sewn hem I admit, I am not exactly thrilled at the look of the shade cloth. 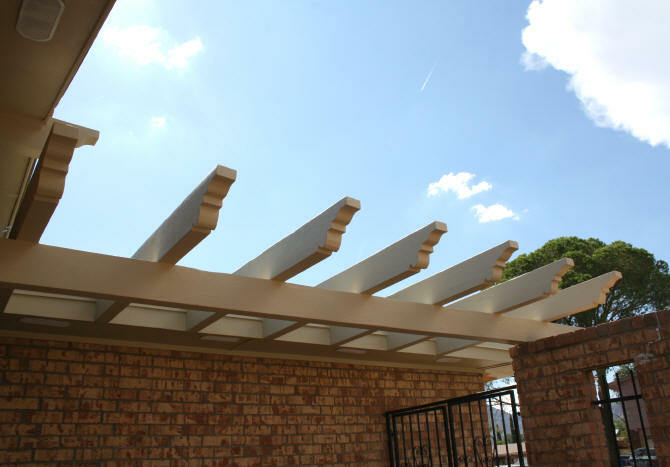 But it will protect the beams and provide some much needed shade in this area. For less than $100 (shade cloth, moulding, and screws), this did the trick. 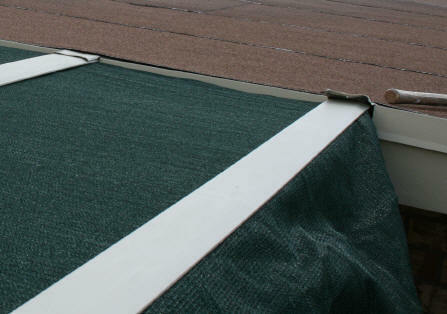 There is a little space between the cloth and roof as seen in the photo at left. This is because the edge of the roof was not exactly straight. This is ok because rain can run off here. As for rain...we had some rain the day after I installed the shade. The water seems to pool toward the center of the shade between each beam before it drips through. As long as the water is dripping away from the beams, I am happy. 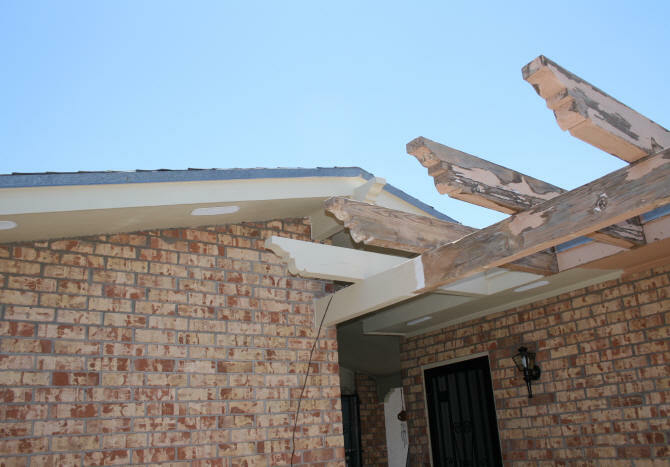 Update April 2015 -- In February 2015, I needed to remove the shade cloth when I had the garage roof torn off and replaced with a new roof with a higher pitch. See the construction on this page... 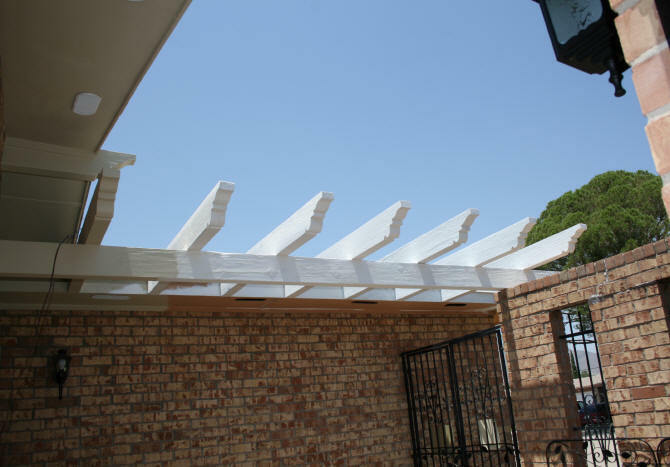 The construction was done with the wood beams in place. 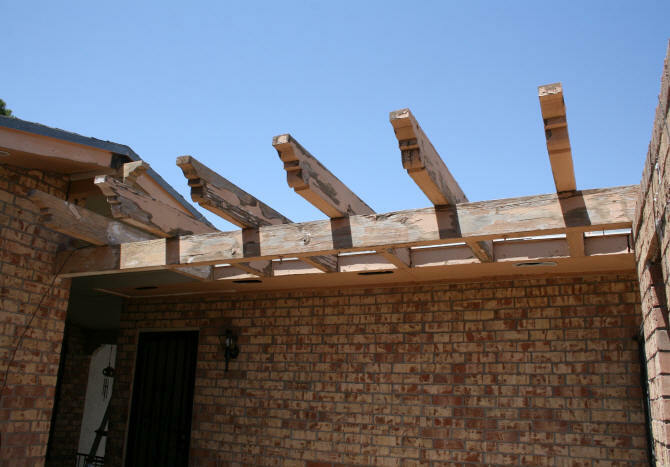 After all of the work I had done on these beams, they were going to stay in place! As I had planned, the moulding on top of the shade cloth was removed fairly easily. The only problem I had were some screws that did not come out easily. The shade cloth was still in great shape. I will be placing the cloth back up later this month. Also the entire soffit area at the end of the beams was re-done. Styrofoam ceiling tiles were placed on to give the soffit a unique look. 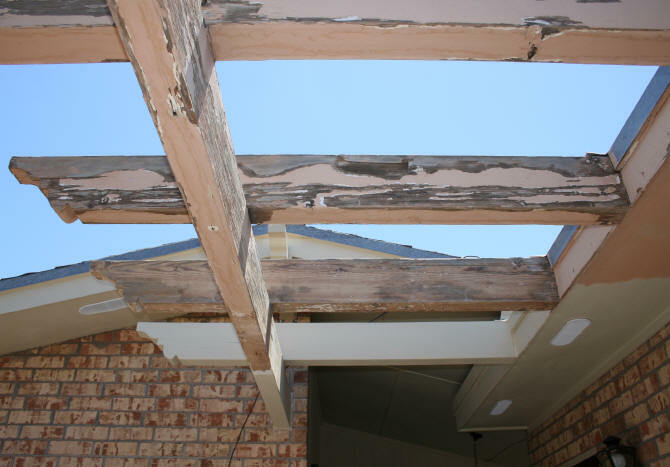 Also, the fascia between the beams took a beating during construction. Scrap pieces of ceiling tile were used to cover up the damage.